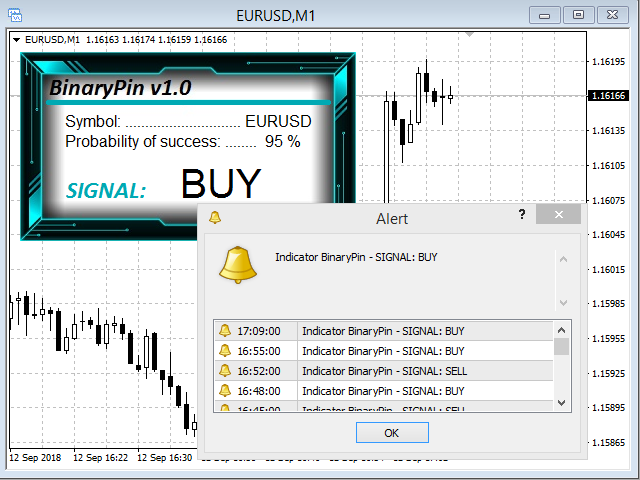 BinaryPin is an indicator developed and adapted specifically for trading short-term binary options. The indicator's algorithm, before issuing the signal, analyzes many factors, such as market volatility, searches for the PinBar pattern, calculates the probability of success when making a deal. The indicator is set in the usual way. The indicator itself consists of an information window where the name of the trading instrument is displayed, the probability of making a successful transaction, the signal itself ( BUY , SELL or WAIT ). The appearance of a trading signal is also accompanied by a sound signal and an Alert window. It is also possible to send notifications to the mobile terminal. The time period of the chart on which the indicator is set should coincide with the expiration of the binary options. Select the trading instrument and expiration time of the binary option. I recommend trading short-term binary options. Wait for the appearance of the trading signal and make a deal in its direction. Excellent indicator, although it is necessary to fix some details, which I believe the owner of the same will fix, Excellent !! Добавлена информация в окно Alert - торговый символ.